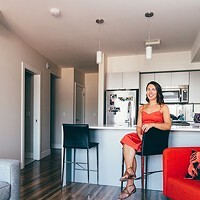 "It literally looks as much like a blank slate as possible, which is kind of intimidating at first, but luckily I kind of had a vision of what I wanted," says Jillian Tonet of the north end loft she and her partner Crissy Goodwin bought about a year-and-a-half ago. The first-time home-owners were already sold on (and renting in) the neighbourhood thanks to its walkability and strong ties to the city's music scene, but the appeal of the sleek, sunny, LEED-certified sealed the deal. 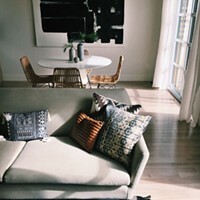 With their bright white blank slate in mind, Tonet and Goodwin started their new home from scratch—as two of the building's first residents, they made the move with very little so they could piece together the perfect space. 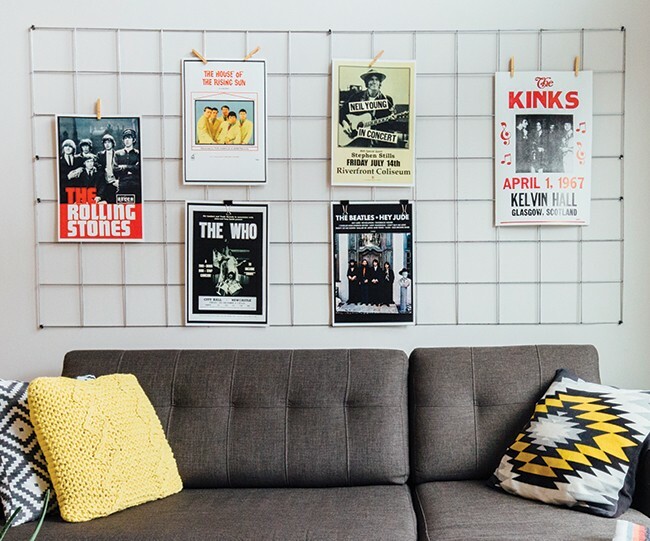 "We're total dorks about '60s and '70s music so that was really key to the inspiration, and I wanted the major pieces we brought in to have a more mid-century feel and the accents to feel more industrial," says Tonet, a self-proclaimed ever-student, studying a master's in organizational psychology. 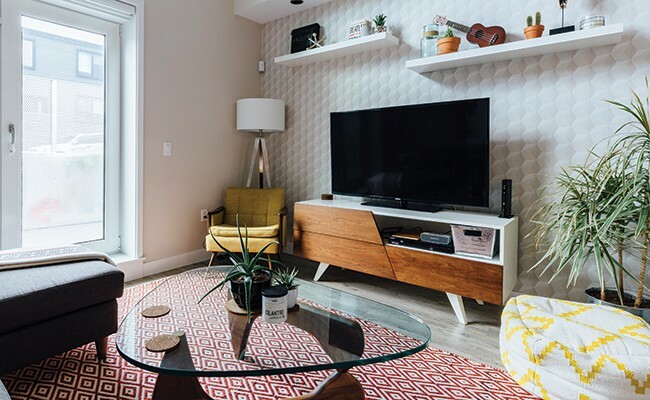 Metallic and concrete accessories helped pull that look together, as did a futuristic all-white patterned wallpaper and the star of the show—their "one major splurge item"—a retro-vibe credenza that acts as their TV stand. "I live my life in monochromatic colours, but Crissy really brought in the pops of colours like the red in the rug or the harvest gold," says Tonet, whose time living in southern California inspired some of the southwestern style textiles and accessories that bring warmth to the open space. "In Halifax it's all about the hunt. We had to look everywhere to find the pieces that fit with our vision, from box stores to antique shops to Kijiji," she adds, crediting the internet for her wallpaper selection, Attica for the splurge and a DIY project for the poster gallery. "The cool thing about having smaller space is it forces you to be creative and step outside your box." But really, she says, though it clocks in at 953 square feet, the space is more than enough. "For us it's big, moving from the places that we were. It feels like the perfect space for the two of us—but we're also very compatible so living together is easy."